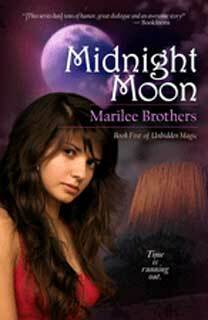 Fellow author and friend, Marilee Brothers has recently published book #5 in a series that has been described as: "Cross Twilight with a Stephanie Plum book, and you'll get Moonstone. It's supernatural and smart, funny and affecting. I didn't want to put the book down..." Take a look at the end of this post for the blurb to "Midnight Moon". She also has an excellent blog called: Book Blather which covers all things bookish. Get published under your own name as a freelance writer. You should write several books and get them published – not always the world’s easiest task, but you can self or indie publish if needed – and list them on Amazon, Barnes & Noble, listing any ebooks on Smashwords, etc. The important thing is to have some books running under your name. And you can publish articles online through sites such as Ezine Articles, which will help build your credibility as a freelance writer and get you some portfolio fodder too. Sign up and work jobs at some Internet freelance writing sites. These are sites such as Guru.com and Freelancer.com. You just sign up for free and run an online listing, offering your services, and take jobs as they come in. You have to bid on them, so the money won’t be good, especially at first. The point is to build up good references showing your work as a freelance writer. And if possible, get some jobs as a practicing ghostwriter this way. Make sure your name isn’t listed, but that people can contact the clients about your ghost writing work. Build or have someone build you a ghost writing services website. This should include your freelance writing portfolio, an online resume, access to work samples, and references from satisfied clients. Try to get as many ghost writing references as you can to display here. Then search engine optimize your site, using current SEO techniques, especially optimizing for Google and Bing search engines. You want to come up under several relevant keyword search terms relating to ghost writing services in the organic SERPs results. Create an online presence. This can be done through advertising, such as taking out a Google AdWords account, advertising on Twitter, and creating a Facebook account where you get a lot of “likes” for your business page (be sure to create a business page, named for your business or something relevant to it), creating a Twitter account and getting a lot of followers (thousands of them is best, and you can get them by following a lot of people – many of them will follow you back), and finally by creating a LinkedIn account (LinkedIn is the premier business social network on the Internet). Get in as many popular online social networks as you can – it helps to get on Pinterest, Klout, MySpace etc. Get word of mouth out about your new business. This involves taking out ads in print writers’ magazines; circulating word about your new business in your own hometown; becoming a Better Business Bureau accredited business; getting reviews from other people on Angie’s List and Yelp, among other Internet sites; sending out email messages to lists (this must be done in a non-spammy manner); etc. Utilize every way you can think of or access to get word out about your new ghost writing services business. Once your ghost writing services website gets running, and you start to get hits, you can also add services to your website such as a free newsletter and an email list that people can join, and you can add Google Analytics or another such free service that checks your website statistics, showing how many people are visiting your site, where they are coming from, which keywords they are using, etc. There are in fact many such things you can do to improve your website. You can even blog on other people’s writers’ websites, posting as a guest by writing them and requesting to guest post on their sites. You write a blog post about writing or ghost writing or another such relevant topic, and you enclose a link back to your ghost writing services website, following the current rules of SEO such as varying link anchor text, deep linking to pages within your website, etc. Finally, once you’re an established ghost writer with lots of connections and have plenty of references from ghost writing clients, amass a long list of literary agents and commercial, self and indie publishers, and write them one at a time asking if they are looking to hire an in-house ghost writer to work on incoming book manuscripts from writers who need their work edited. A lot of ghostwriters nowadays work for agents and publishers, and it’s their main source of ghost writing income. And lastly, when you charge fees to your clients, always charge in upfront installment payments, being paid during the course of completion of the ghost writing project. Never take “on spec” or percentage payments unless they are in addition to substantial upfront payments. And sign a formal contract, also sometimes an NDA or non-disclosure agreement, every time you arrange a ghost-writing project. It’s best for the contract to contain language limiting the total amount of revisions to the ghost writing work, and limiting the total amount of indemnities to something reasonable. Follow these simple rules, branching out from them as directed, and you will probably get a wonderful Internet presence and a beautiful new ghost writing services business started this way. Hi, I’m Karen Cole, your Friendly Neighborhood Ghost Writer! I run Ghost Writer, Inc., which offers you affordable freelance writing, ghostwriting, editing, marketing and promotions services for books, manuscripts, screenplays, music and lyrics over the Internet. Visit us at affordable ghost writing service and see what we can offer you that will fit within your budget needs! In two weeks, during the summer solstice, Allie's going to face the biggest challenge of her life, fighting against time to save the world from a Trimark invasion. You'd think the world of weird might leave her alone to plan how she's going to survive. But nothing in Allie's world is simple or easy, especially when she's attacked by Trimarks trying to steal the moonstone. Then Sammie disappears into the faery world of Boundless, and Allie must follow and bring her home, only to find the fairy queen, Luminata, isn't about to let Allie leave. So, what's a girl with magical powers supposed to do? Fortunately, she has a team to help her, a team with special talents of their own. 1. Get born into a decent family. 2. Be good at school, especially in science and maths. 3. Graduate from a good university with a degree in sciences, and at the same time qualify as a pilot. 4. Get an MSc and PhD. 5. Apply to NASA or such. I'm challenged enough writing my own books. Pretty sure no one would want me to write theirs, either! I'm with you, Alex. Great post! The second way is that all the backlinks you create will cause your websites ranking to increase and go up the listings.